Marimo and a shrimp at the California Academy of Sciences in San Francisco. Under the waters of Lake Akan, in the far northeast of Japan, live one of Japan’s cutest natural wonders: marimo. 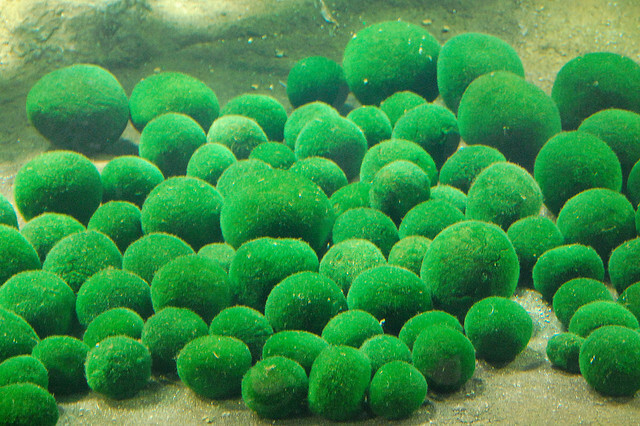 Colonies of these spherical green balls, super-soft and velvety to the touch, lie hidden a meter or two below the surface. Designated ‘Special Natural Monuments’, these strange creatures have become a major tourist draw, and are even honoured with an annual festival dedicated to their preservation. Marimo are sometimes called ‘moss balls’ in English, but are really a species of green algae. They live in shallow waters around the lake’s edge, rolling around as gentle waves lap at the lakeshore. This constant motion is what gives them their spherical shape, as every side gets its turn to face upwards and soak up the sunlight. Marimo can be found in a few other locations around the world, but they grow far bigger in Lake Akan than anywhere else – up to 30cm in diameter. That’s more than twice as big as those found elsewhere. Marimo don’t grow fast though, only 5 or 10mm a year, and it takes more than 100 years for them to reach their maximum size. Beautiful Lake Akan, under whose waters lie colonies of giant marimo. 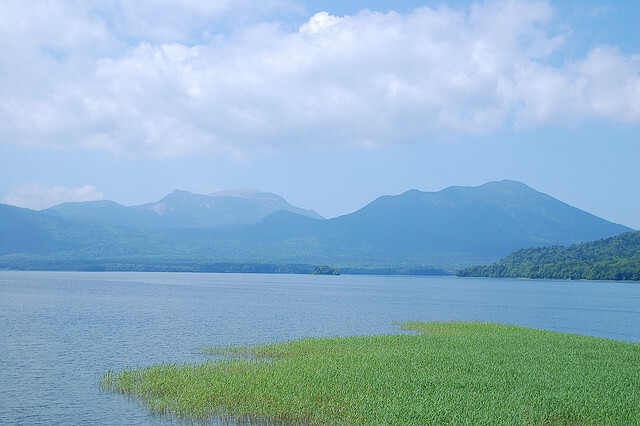 The lake is in Akan National Park, also famous for its volcanic scenery and crystal-clear lakes. Marimo have long been popular as pets – so much so that the collection of them from the wild began to seriously threaten their numbers, and so in 1920 they were made a protected species. You can still buy marimo, but the ones on sale are either bred in captivity, or are created artificially from free floating algal filaments. Either way, they’re easy to keep as pets – they will live happily in jars of water, or alongside fish in aquariums. In order to maintain them in a healthy condition, and to achieve a spherical shape, you need to turn them over regularly. Your fish might do this for you, as they often seem to enjoy playing marimo football. The marimo sometimes seem to have a mind of their own anyway – they float upwards when they’ve produced oxygen bubbles through photosynthesis, and often seem to find some way to roll about of their own accord. And if your marimo breaks apart, don’t be disappointed – they’re solid algae all the way through, so this is just their way of reproducing – you’ll end up with two marimo instead of one. 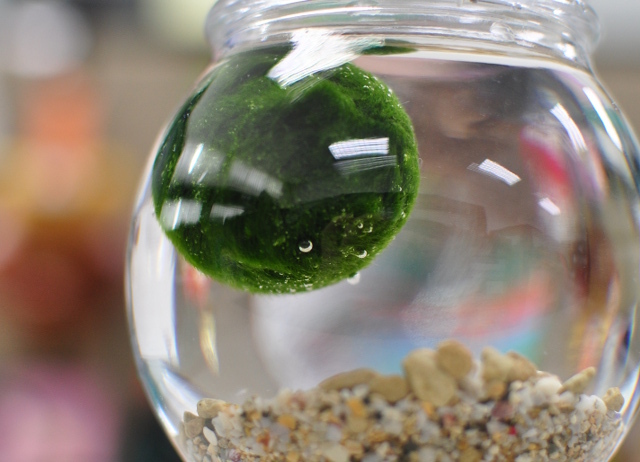 This marimo has lifted itself up by photosynthesizing bubbles of oxygen. A marimo festival, led by Ainu (the native people of northern Japan), is held every October in Akanko Onsen on the shore of Lake Akan. It was begun in 1950, when there was serious concern about the survival of the marimo, with the aim of awakening people’s love for the species. A nationwide appeal was made for people who had pet marimo that had been taken from the lake to return them. The 48 marimo that were returned were blessed by an Ainu priest, and then ceremonially released back into the lake. Nowadays, each year marimo are taken from the lake, cleaned, blessed and then paraded through the streets by priests and other Ainu in traditional dress. They are then reverently returned to the water by a priest riding in a dugout canoe. The festival also features a field trip to observe marimo in their natural habitat, the procession of a portable shrine containing giant models of marimo, and traditional Ainu dancing in honour of the marimo. If you can’t make it to Lake Akan in October, you can still see marimo at the Marimo Observation Centre located on an island in the lake. Over 500,000 people visit each year to see a live CCTV link showing wild marimo under the water, as well as tanks in which you can view marimo at various stages of their life-cycle. 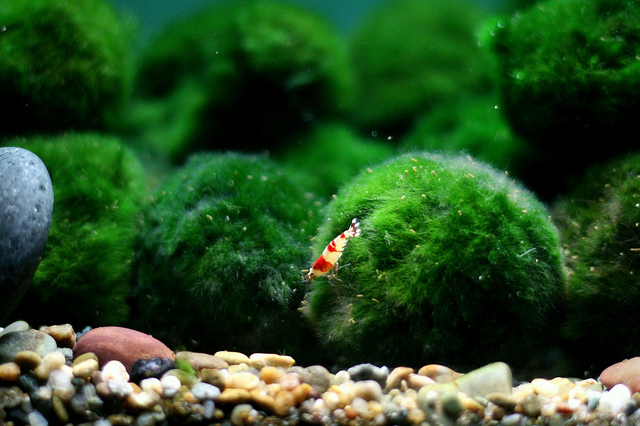 You might also be able to see small marimo by visiting a local aquarium, as they’re becoming increasingly popular additions to home aquariums. And if you can’t find a marimo locally, you can even buy them at Amazon. But no matter where your marimo comes from, please take good care of him.